In the Midwestern city of St. Louis, Missouri, a number of unique Italian-style dishes carry out a niche existence in local lore. One of those is the “St. Louis style” pizza, a thin-crust pizza topped with a strange provolone-cheddar-Swiss concoction known as provel cheese. Yet another is a famous salad that includes romaine lettuce, onions, artichoke hearts, Parmesan cheese, and a dressing made from vinegar and oil. Also in the mix is toasted ravioli, a type of ravioli that has a crispy outer crust. Inside is a filling, typically cheese or beef. The ravioli are typically served with marinara sauce and / or grated Parmesan. Toasted ravioli are popular as appetizers, although St. Louisans will sometimes also serve them up as a main dish. Aldi — whose U.S. subsidiary is headquartered some five hours from St. Louis, in suburban Chicago — has a limited line of toasted ravioli products. As best as we can tell, whether these are Regular Buys or occasional Special Buys depends on what part of the country you live in. We sampled them to see how close they came to local St. Louis fare. The beef version of Aldi toasted ravioli comes in a one-pound frozen box. According to the box, that translates to roughly 24 pieces. The instructions are exclusively oven: there is nothing on the box for any other method. The ravioli cook for 8-10 minutes at 425 degrees, but the box warns against both undercooking (make sure they reach 160 degrees) and overcooking (make sure the ravioli don’t puff or pillow out). In our experience, if you follow the cook time and keep an eye on them, you’ll be fine. Out of the oven, we found them to be crisp and very tasty, with a flaky crust and a robust flavor, both with the crust and the seasoned beef inside. The truly discerning taste-tester might be able to discriminate these from the restaurant variety, but we can’t. For the vegetarian (or just the cheese lover), there is a variation on the Mama Cozzi line that replaces beef with a quartet of ricotta, mozzarella, imported Romano, and Asiago cheeses. Like the beef ravioli, it is a one-pound box of about 24 pieces. Also like the beef ravioli, these heat up at 425 degrees, although, strangely, the instructions only say 8 minutes rather than the 8-10 of the beef ravioli. These are, like the beef, good. Really good. We think we might even like them more than the beef ones, even though the beef ones are also really good. Toasted ravioli are made to be dipped in marinara, and Aldi offers such an option in the form of the Priano Marinara Sauce. Unlike the ravioli, these containers are found in the refrigerator section. Also unlike the ravioli, they contain absolutely no heating instructions whatsoever. We opted for the simplest method, which was microwaving, although that does come with the same drawback most tomato-based products do in the microwave: possible splatter. There may be other methods to heat it, such as placing the entire plastic container in a bowl of hot water, but we recommend the microwave. This marinara makes the perfect dipping sauce, especially paired with another Priano labeled product, Priano Shredded Parmesan. If you’re looking for a St. Louis-style appetizer (or maybe more), the Mama Cozzi’s Toasted Ravioli line has you covered. Paired with Priano Marinara Sauce and Priano Shredded Parmesan, this is about as good as you could hope to get short of going to the Hill. Recommended. mama cizzi’s toasted ravioli, according to observation and Lebanon PA store manager, is a “special” which comes in twice a year. Manager has no provision to order more – it is corporate who decides what to ship. Insert sad face here. They are good. I am from St Louis and now in St Petersburg Florida. 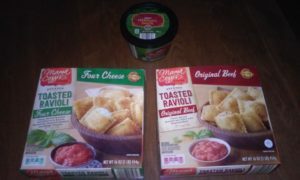 I was shopping last month at the Aldi on 34th St. South and discovered a box of the Mama Cozzi’s Toasted Ravioli. I purchased the ravioli to give it a try. To my surprise it was every bit as good as the toasted ravioli in the restaurants in St. Louis. I was thrilled. I went back to buy more for me and also for my sister who loves them even more. When I went back I couldn’t find them. I tried again a second time and once again, no luck. Please let me know if there are any left in the stores in St Pete. I’ll go wherever they are and buy them. Better still…please bring them back to my 34th St. store. I live in a big condo complex and want to share them at our social events…a taste of a St. Louis favorite. This is cruel treatment to your customers. You have an item that many people love, obviously, but Aldi’s refuses to stock it on a regular basis or order them. It seems to me it would be a money making deal for Aldi’s with happy customers as an extra added benefit. Think about it! Please,please please,keep Aldis supplied with toasted ravioli,it is the only place in Cleveland to buy them!!! Aldi just had Mama Cozzi’s Toasted Ravioli back in stock a week or two back, and I only bought one box. As of two nights ago, not only were both local stores completely out of it, but anyone I could find to ask had no information about it at all, or had never even heard of it. I am a transplanted Hill native of St. Louis living in The Villages, FL. I got the same answer from corporate at Aldi’s.i.e., that this is an Aldi’s Find and not available year-round so I decided to ask my local Publix store to stock it. We would be happy to know if there is any other store in the Central Florida area that stalks this product. That is exactly what I did, and Corporate told me that the Aldi Finds cannot be provided on a regular basis, they are only promotions.